I am happy to be part of the 2013 Kraft Tastemakers team. This post is part of my continuing commitment to bring family friendly recipes to you that are made from things you’re likely to have in your pantry at most times. Do any of you remember the Jell-O Pudding Pops from the 80s? I ate my weight in those as a kid because the camp my dad ran procured them by the crate. I used to slip into the walk-in cooler for a pudding pop whenever the fancy struck. Less present, but equally loved, were the Jell-O Gelatin Pops. Fruity, icy, and no drip, the pops seemed almost like they were whipped before they were frozen. I got it in my head the other day that I wanted these and since they’re no longer on the market, I made my own! I busted out my Knox Unflavoured Gelatin (that’s an Amazon affiliate link, by the way), a bottle of Cran-Raspberry Juice, a wee bit of sugar, and my trusty stand mixer and Vie-Oh-Lee! We had Whipped Fruit Ice Pops. Super smart snacking for summer, I’d say, wouldn’t you? They’re a little crazy looking, but I can explain! I wanted my ice pops to have the same consistency that I remembered so I made classic Knox Blocks, chilled ’em until they were as firm as they should be, cut the stuff into small cubes, then beat the tar out of it all with my stand mixer. It got fluffy and airy and looked a little like I had whipped cream into it. That was fun and a little gross looking, honestly, but it made filling the ice pop molds evenly a bit of a challenge. It doesn’t effect the overall ability of the stuff (technical term) to freeze together coherently, but it looks a little irregular. I think it lends to the charm. If you’re anxious to make some of this and don’t have ice pop molds, or if you want to be a bit more sophisticated and grown up about the whole thing, you could always scrape the whipped gelatine into a non-stick spritzed 9- by 13-inch baking dish and cover the lot with plastic wrap before freezing. After it’s solid, use a spatula to pry it out of the pan and onto a cutting board. Slice into small squares or punch into small circles with a round cookie cutter. Top it with berries and serve that like you’re Madame Fancy-Pants. When it’s not Dr. Seuss-y looking on a stick, it’s surprisingly sophisticated. Gelatine WAS the dessert of kings and queens for ages, after all. This is a no-bake dessert that’ll keep everyone happy (including the cook!) This would be fantastic for the 4th of July! Do you need more ideas? Be sure to check out Recipes by KraftFoods.com for some fun summer help and more smart snacking ideas! Airy, fruity, refreshing and wholesome, these Whipped Fruit Ice Pops are made from three simple ingredients. 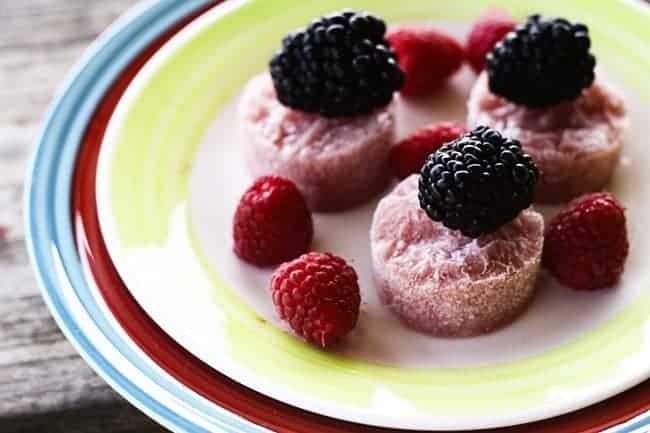 If you're feeling more sophisticated than popsicles, though, you can freeze the mixture in a pan, cut shapes from it, and serve topped with fresh berries! 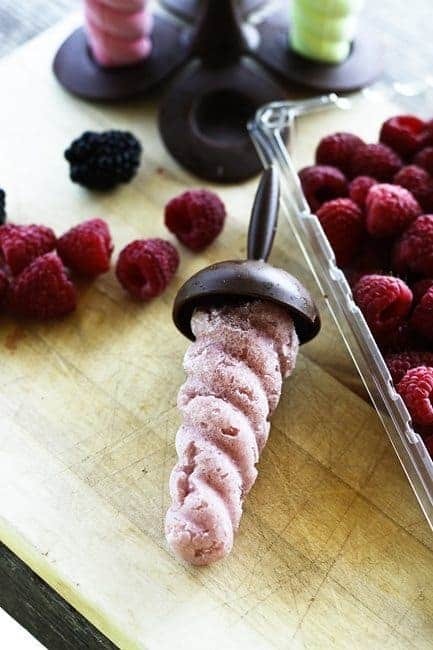 Berries if serving cut into shapes rather than in ice pop molds. Pour 1 cup of the fruit juice into a heat-proof 2 quart dish. Sprinkle the gelatine over the top and let it sit, undisturbed, for 1 minute. Stir the remaining juice and sugar or honey together in a heavy pan over medium heat until the sugar is fully dissolved and the juice is simmering. Pour the hot juice over the gelatine in the bowl and whisk gently until the gelatine is completely dissolved, about 5 minutes. Spritz a cake pan with non-stick cooking spray, pour the hot juice mixture into the pan and cover with plastic wrap. Refrigerate until firm, about 3 hours. Cut the firm gelatine into small cubes and scrape them into the bowl of a stand mixer fitted with the whisk attachment or into a sturdy, large mixing bowl (if using a hand-mixer). Slowly start beating the gelatine (because little bits will want to jump out of the bowl and fly everywhere if you start on high speed) and work your way up to high speed. Beat the gelatine until it has been broken up into very small bits and looks almost creamy. This will take about 15 minutes. Lightly spritz the insides of ice pop molds or dixie cups with non-stick cooking spray to make them easier to remove once frozen. Use two spoons to fill the ice pop molds. Drop the sticks into the center of each mold or cup and freeze until solid. These are good for up to a month in the freezer. Lightly spritz a 9- by 13-inch pan with non-stick cooking spray. Scrape the whipped gelatine into the prepared pan and use a silicone or rubber spatula to evenly distribute it and smooth the surface. Lay plastic wrap directly on the surface of the gelatine and freeze until solid, about 5 hours. Remove the plastic wrap and use a spatula to pry the frozen slab of whipped gelatine out of the pan and onto a cutting board. Use a sharp knife to cut into squares or a round cutter to punch out circles. Serve immediately topped with fresh berries. Disclosure: This post is sponsored by KraftFoods. I am a compensated 2013 Kraft Tastemakers team member. All opinions remain, as always, my own. Wow! What a cool idea! These sound awesome and they are so cute! Thank you, Tieghan! They’re light and easy to eat, that’s for sure! This looks like a summer treat that would be a total hit! Love the shape of these too! Yay! You like my twirly whirly pops!! That makes me happy! So cool looking! Bet they are yummy! You are fancy pants with the great idea of putting the popsicles in a baking dish and using a cookie cutter to make those cool circle ideas. I love this idea! Since you brought up the 80’s, my mom used to make us coca cola popsicles. They were fun. Fresh fruit is better! Viva the 2010’s! Amen! Long live fancy pants, eh? These look very refreshing. Got the ingredients this morning to make. Have a question. How do you think Steeva in the raw would work here? I’ve heard it’s sweeter than sugar (even though it’s suppposed to be cup for cup). Any suggestions? I bet you could use stevia in the raw… it’s worth a shot anyway! Please let me know if you end up trying it! I loved pudding pops! Do they still make them?! It was beyond awesome to see you, too, Lisa! I hope our paths cross again soon! As for the ice pops, I hope you like them as much as we do… Let me know how you make out! It was SO nice to meet you this weekend, Rebecca! These pops look perfect for beating the heat in Austin. Hope you enjoyed your time here! Thank you, Georgia~ I had a wonderful time in Austin and I’m already trying to figure out how to come back soon. It’s such a neat city! I hope you get a chance to try these pops, soon! Could I PLEASE have a printable recipe for English Muffing bread, sounds delightful!! Cheers, Elaine. Hi Elaine- Click this link and it will take you to my English Muffin bread which has a printable recipe toward the end of the post! YAY! Hi Sherri Jo! I hope your kids dig them! These look great! My kids would love them! Oh wow, these look wonderful 🙂 I bet they taste amazing! I can’t wait to try this out! I’m always looking for a good dessert recipe that isn’t really unhealthy. I want to try and keep my family as healthy as possible after all but I don’t want to sacrifice great taste. These fruit pops are way more healthy than other options because they’re made with real fruit but they have great flavor for the same reason. Great idea and they look really interesting too. Those look really good! My wife worked at Kraft and of you’d like to try it, she has the recipe for gelatin pops. 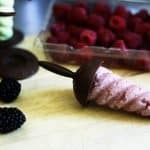 Like homemade pudding pops you fold half container Cool Whip into the prepared gelatin, 2 packs with 3 cups water (flavor of choice, I like one of the original and go raspberry) after that pour into favorite mold, freeze and enjoy! We make then in the summer and they taste exactly like the ones you can buy!